Invited to present his first feature film "My Life With James Dean" in Normandy, the young director Graud Champreux (Johnny Rasse) has no idea this film tour is about to change his life. From wild stampedes to woeful screenings, from trawler trips to drunken evenings with hot young guys, Graud ends up finding inspiration in an unlikely town at the end of the Earth. 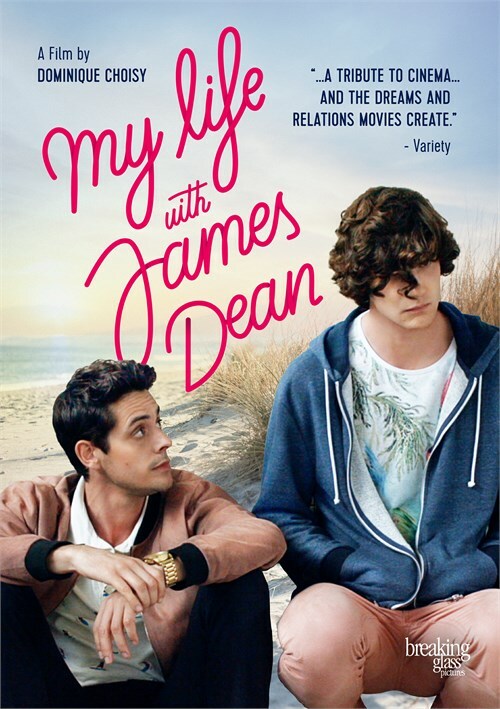 Written by Dominique Choosy, “My Life with James Dean” turns on a buff tyro film director Géraud Champreux (Johnny Basse) who finds fresh inspiration in France’s deep Channel coast North when dispatched to present his first feature in three cinema houses in Calais and environs. There is a fish-out-of-water comedic element to his promotion tour: Geraud is lost as soon as he steps off the coach at his first stop after a boy steals his cell phone. His movie – a frank Jean Genet-ish LGBT tale of carnal passion – doesn’t see the most likely title to move waves at the cinemas; and Géraud is as concerned about breaking up with the film’s leading man as in promoting his movie. And yet, and this is the magic of filmmaking, the title and Géraud himself begin to collect supporters, from the frumpy receptionist at the chintzy hotel he puts up at, to a local cultural activist who books the cinemas and has love problems of her own, to the young projectionist at the first cinema where it plays, who falls head-over-heels in love with Géraud. In maybe the film’s most moving scene, an aging woman who catches all the sessions is revealed to be Géraud’s estranged mother. As the promo tour careers from dire screenings to trawler trips and drunken evenings, Géraud gets the inkling of inspiration for a movie which will pay an upbeat, musical homage to the warmth of reception he finally receives in this windswept part of France. An alum of Paris’ prestigious L’Idhec film school and an editor at French pubcaster channel France 3 and teacher at the college of Amiens, Choisy broke out to attention with his debut, “Confort Moderne,” a drama about a woman attempting to shape her own life which shared the Fipresci award at Argentina’s 2001 Mar del Plata Festival. Choisy’s second feature, 2012’s “Les fraises des bois” – recounting the bonding of two social misfits, a gay supermarket cashier and a farm girl, each with a secret – was also knit with a visual humor and unspooled in northern France. “My Life with James Dean” represents a more upbeat turn.